Good news: after all your searching, writing cover letters, and perfecting your resume, you have just received the call we all hope to get: a company you would really like to work for wants to have you in for an interview! Flash forward: you arrive for your interview, feeling prepared and confident. You introduce yourself and everything seems to be going well until… the questions begin and suddenly, all the research and surety you had going into this process, goes out the window. Now what? Whether you are interviewing for a job in manufacturing or the service industry, it is important to be prepared. 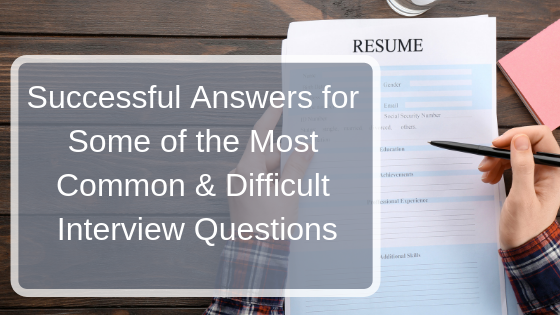 The following are some most common & difficult interview questions and some tips on how to answer them and avoid sounding vague and generic. Question 1: What are your weaknesses? If you are not prepared, this question might feel loaded and catch you off guard. First, try to focus on ways you have grown as a worker, or as a person. Maybe you have trouble being on time and are applying for a job in manufacturing, where punctuality is imperative. Rather than point out your shortcoming, frame it in a way that shows what you have done to amend your tardiness — perhaps by saying something along the lines of, “I used to struggle with time management, but that is why I always set three alarms for myself, and I am never late anymore.” This shows an effort for self-awareness and improvement. Again, in both circumstances, you are speaking about ways you have grown, or how you are working on a particular weakness, rather than simply pointing out a character defect. Considering examples of this beforehand, that are specific to the line of work in which you are applying can save you the time fumbling through this question in an actual interview. Question 2: Can you tell me about a time you experienced conflict at work and how it was resolved? When asked this question, it is crucial that you focus more on the resolution than the details of the conflict itself. Let’s say that your conflict involves a disagreement with a coworker: maybe someone was late to relieve you from your shift or maybe they poached a customer from you. These types of interactions can get under your skin and probably when recalling the story to your friends, you would describe at length how wrong your coworker was. Still, in an interview, it is important that you give more detail about how you resolved the issue, rather than the issue itself. For example, perhaps you asked to speak directly with the coworker in order to resolve the grievance so that it did not affect your whole shift. Or, perhaps you formally made your complaint to a manager so that he or she could mediate or speak to the coworker directly. Focus on the fact that the resolution was swift and direct; try not to harp on your superiority over a coworker; speak constructively and use collaborative language: “we”, “us” instead of “her/him” “I,” when describing the specific solution that was reached. Question 3: Can you describe a time when you had to change a process? The answer to this question should be about showcasing your flexibility as a worker. Companies often try to improve upon their productivity, so demonstrating how you fit into that paradigm can really give you a leg up over the competition. If you are applying for a job in manufacturing, you might be able to discuss your flexibility with following new checks on the line — maybe you have been in charge of a new machine or had a hand in developing better safety checks. Similarly, jobs in customer service also want to know that you can follow new ideas or initiatives. Maybe you have worked in a restaurant that changes in menu seasonally or you have been in an environment where you could speak to new environmental initiatives such as the use of straws. Most interviewers want to know that you can be open to new ideas, engage and collaborate with others, and help work out the kinks as a company strives towards best business practices. Describing a time when you adapted or contributed to change is an opportunity to illustrate these skills. Question 4: What questions do you have for me? This is usually the very last question and the temptation oftentimes is to quickly shuffle through it and end the interview. Besides, if you don’t have any questions, you sound smarter, right? Not really. In reality, a good question (or two) for the interviewer can leave a lasting impression and demonstrate interest. You want to avoid putting your interviewer on the spot, of course, but if you can, ask a question that shows your insight and investment for the company/position you are applying for/the person you would work for. Do your research and try to have a question prepared, e.g., what can you tell me about this job that was not listed in the job description? ; how would you describe your management style? ; what is the next step in the hiring process?